Thinking of adding custom barbecues to your outdoor space? Food grilled on a quality barbecue has a taste that can’t be replicated. Along with the matchless flavor and delectable aroma, cooking on an outdoor grill is an experience in and of itself. But only if you aren’t struggling to get your equipment to work like it’s supposed to. Instead of fighting with an aging cooker on its last legs, call Desert Environments for custom barbecues in Scottsdale. Just as with guests gathering in the kitchen for indoor parties, you can bet that your guests will hover around your custom barbecue when you entertain outdoors. Whether you need 5000 or 15,000 BTUs, we’ll make sure your barbecue brings in the heat. What exactly is a BTU? While it’s the standard unit of heat measurement, most people don’t know what a BTU is. One BTU is roughly the amount of heat required to raise one pound of water by one degree on the Fahrenheit scale. 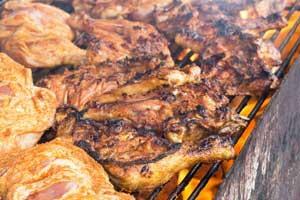 For grills, the number is how much heat can be given off by all the burners in one hour. But how much do you need for grilling? Generally, instead of looking at the total BTUs alone, it’s a better idea to check total BTUs per cooking space, and 80-100 BTUs per square inch will handle most items. What options do I have for my bbq grill? As many as you’d like! We carry only the highest-quality grills so that you can be sure that no matter your specific style or needs, we’ll exceed your expectations. We use hi-grade, stainless steel bbq units constructed of solid masonry block on a cement foundation. These can be enhanced with stone, tile or stucco or any other material to match an outdoor kitchen. Some of our cooking options include side burners, access doors, refrigerators, warming trays, and more. Optional hi or low voltage lights can be installed to shine a light on your favorite steak or grilled kabob. As a versatile landscaping company, we’re ready to handle whatever you need. Want your bbq to match an outdoor fireplace or mimic the rock style of your water features? We can do that. Want your grill just far enough away from your pool so your food doesn’t get splashed? We can handle it. Whatever you need, our experienced landscape contractors can take care of it. So call or contact us today to get started, and we’ll even give you a free estimate!